If you’ve been to other Congregational or Protestant churches, our worship services will feel familiar. 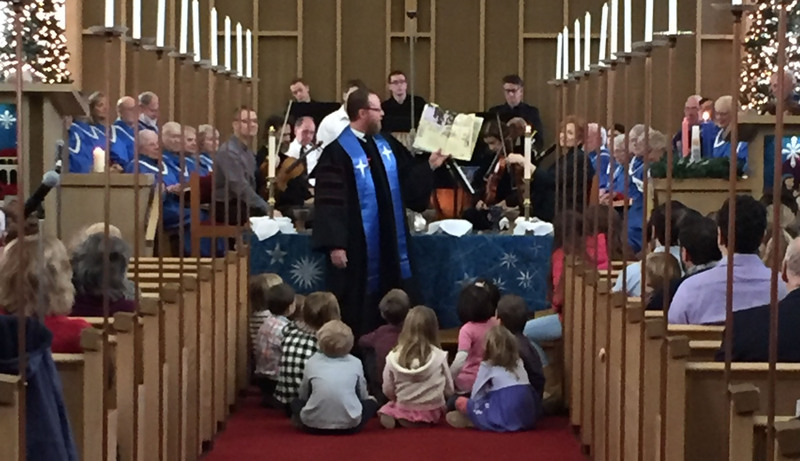 If this is all new to you: We usually have 3 hymns, readings from the Bible, a children’s conversation, a sermon, a time of prayer, and special music by our choir or guest musicians. Several Sundays a year are reserved for special observances, such as Scout Sunday, Celebration Sunday (when we celebrate our children’s and youth ministries), an Epiphany puppet show, Music Sundays, and at least one Sunday when we leave the building to do a service in one of Ithaca’s parks. CAN I JUST “SHOW UP”? Everyone is truly welcome to all of our programs and activities (even those that ask for people to sign up in advance). If something interests you, just come! Services typically last a little over an hour. Special Sundays and Communion Sundays are sometimes closer to an hour and 20 minutes. Children are always welcome (especially crying ones)! Children are present for the first part of our worship service, and after the scripture reading, the pastor or one of our members has a special conversation with kids. Then, children in pre-K through 3rd grade can go to Children’s Worship, children in 4th through 6th grades can go to a Tweens Class, and youth in grades 7-12 can join the Youth Group upstairs. There is also a staffed nursery for children ages 0-3 available downstairs throughout the service. Of course, if your children prefer to remain in the service with you, they are welcome! On the first Sunday of the month as part of our worship, we celebrate the ancient Christian practice of communion, also called the Eucharist or the Lord’s Supper. Our communion table is open, which means EVERYONE who wishes to participate is welcome (even children) – it is God’s table, and God welcomes ALL people! We believe that in sharing the communion meal, we are remembering Jesus’ way of life on earth and acting out God’s vision for the world, where all people are family, and all people are fed. We invite you to join us in this sacred and transformative celebration! Everyone in our church wears name tags, and we greet each other during the service in a liturgy called “Passing the Peace.” People will come up to you! You are also welcome to join us after the service for coffee and refreshments right near our front door. We also have various opportunities for you to plug into the church community and get to know folks. Go to our calendar for more information and sign up for our weekly emails for the latest updates. Yes, there is a lift just inside the front door, an elevator for those who need basement access, and an accessible, gender-neutral restroom on the main floor. You won’t be alone! Come in anyway! You can usually find seating near the back of the sanctuary, or some people prefer to go upstairs and sit in the balcony. Come as you are – we’re glad you want to join us! You’ll find that people wear a range of clothing, from suits and ties to cropped pants and sandals. There is a time during the service when offering plates are passed. There are no obligations at all to give. While many people choose to give to the church monetarily, many also give in other ways (e.g., their time and talents), and let the offering plate pass.